In a studio, Leningrad, 1967. 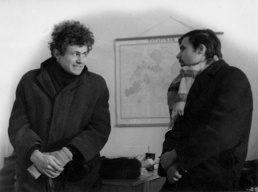 With Alexander Grigoriev at the Light and Music conference, Kazan, 1969. 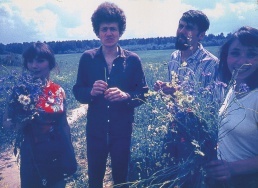 With Tatiana Bystrova, Alexander Grigoriev, and Natalia Prokuratova, 1971. With Alexander Grigoriev, Michel Ragon, Lev Nussberg at the Ragon's studio, Chertanovo, 1971. Born Francisco Infante-Arana [Франсиско Инфантэ-Арана] in 1943 in Vasilevka, a suburb of Moscow, to a Spanish father and Russian mother. He enrolled in the Surikov Art Institute at the age of fourteen, studied there until 1962. Afterwards he studied at the Moscow Institute of Decorative and Applied Arts (1962-1966). In 1966, he joined the group Dvizheniye [Movement], organized by the artist Lev Nusberg, and, in this capacity, played an active role in the non-conformist movement, contributing to more than thirty unofficial exhibitions in the Soviet Union during the mid- and late 1960s. 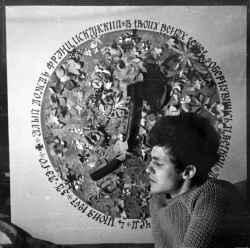 But even though his art always countered the canons of Soviet Socialist Realism and the cultural establishment, the Artifacts -- from the first -- appealed to scientists and engineers and occasionally were exhibited in professional "alternative spaces" such as the Architects' Club in Leningrad (1965) and the Kurchatov Institute of Atomic Energy in Moscow (1966). 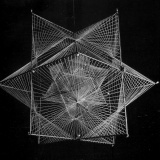 Tension developed between Nussberg and Infante, and in 1970 he officially left the group and, together with his wife, Nonna Goriunova, also an experimental artist, and an engineer, Valerii Osipov, organized a group ARGO with the aim of creating artificial systems analogous to natural phenomena. The feud between Infante and Nussberg over the years grew stronger and spilled out in many mutually incriminating publications and unpublished manuscripts. Starting as a kinetic artist in the 1960s, Infante has made unique contributions to the Land Art movement by building installations or interventions in the natural environment. These are what he calls Artifacts -- assemblages reliant upon the effects of reflectivity, ambiguity, and interactivity that often appeal to the geometric traditions of the Russian avant-garde, especially the art of Kazimir Malevich and Vladimir Tatlin. Interpreting "kinetic" to mean that which is mobile or dynamic, Infante has designed abstract and artificial systems consisting of moving and revolving forms constructed out of concrete material as well as color, light, and sound. In the summer of 1975, he created a kinetic construction for the Soviet section of the exhibition Sviaz - 1975 (Mail and Long Distance Connection - 75) in Moscow's Sokolniki Park. 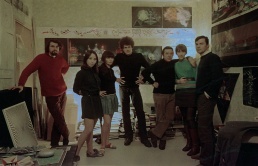 In 1973 he joined the graphic artists' city committee and Moscow Artists Union. Since 1975 he has focused on the Artifacts, expressing his primary impulse to juxtapose the natural with the artificial through outdoor installations and presenting them publicly in limited edition photographs. For example, Infante illustrates his theory of the phenomenon of the spiral in his Spiral series of 1965, in which the infinite tendency of the spiral alternates with the perfection of the horizontal and the vertical: the result is a line turning endlessly in space which, in its momentum, elicits associations with other cosmic oppositions such as good and evil, life and death. In 1996 he received the Russian State Prize for Art. At present, Infante is perfecting and refining his idea of the artifact with new exhibitions. He has participated in numerous national and international exhibitions (France, Germany, Italy, Japan, Korea, The Netherlands, Spain, the United States) and is represented in prestigious private and public collections worldwide. One of his most recent exhibitions Between the Sky and the Earth took place at the Krokin Gallery in Moscow (2011). He lives in Moscow with his wife Nunna Goriunova and two children, Pakhito and Platon, who are also artists. John E. Bowlt and Nicoletta Misler, "Infant of Infinity". Francisco Infante, "On My Concept of the Artifact", 1987. Maya Aguiriano, "Interview with Infante", 1994. Francisco Infante: The Metaphysical Dimension, from the Institute of Modern Russian Culture at the University of Southern Californa. This page was last modified on 2 June 2015, at 11:26. This page has been accessed 17,291 times.